THE COMEBACK KID: a review of "The Visit"
It's been a very rough past few years in the creative life of Writer/Producer/Director M. Night Shyamalan. A cinematic figure essentially written off by critics and audiences alike after the considerably less than stellar efforts of the bedtime fairy tale "The Lady In The Water" (2006), the ecological horror of "The Happening" (2008), the undeniably awful live-action adaptation of "The Last Airbender" (2010), the valiant but failed effort at beginning a new anthology series with"The Devil" (2010), and the brutally panned "After Earth" (2013)--which I didn't even see--Shyamalan, after being hailed by a Time magazine cover feature as the "New Spielberg," was now seen as basically no more than a hack who just got lucky with his breakthrough feature "The Sixth Sense" (1999). As for me, while I never considered Shyamalan to be the next Spielberg or anyone else for that matter, I too was won over by the skill, creativity and ingenuity of "The Sixth Sense," a film that still holds up strongly in terms of the harrowing, ghostly atmosphere it creates, the depth of the writing and performances and of course, that terrific twist ending that works so masterfully and honestly. For me, his follow-up feature "Unbreakable" (2000) remains his finest effort and I still feel that "Signs" (2002) and even the subversive "The Village" (2004) are worthy successors to his very best films. But as audiences began to throw Shyamalan to the cinematic curb, I still hung on anyway, either faithfully or foolishly. Anyhow, I am wondering if M. Night Shyamalan is somehow finding his groove again. This summer, he succeeded with "Wayward Pines," a weird, wild and genre shifting 10 episode limited television series he Executive Produced plus directed the premiere installment. Now, he returns to feature films with the tight, taut little thriller "The Visit," and even as a fan, albeit one whose interest was waning even as I was pulling for him, I have to say that I was happily surprised with the results. And for those of you who have indeed written M. Night Shyamalan off, well, "The Visit" certainly doesn't re-invent the wheel of the horror film but you also may be just as surprised at how effective and entertaining it actually is. Utilizing the "found footage" hand-held camera style that is now a horror film staple, "The Visit" stars Olivia DeJonge as 15 year old budding documentarian Rebecca Jamison and Ed Oxenbould as her 13 year old brother (and imagined hip hop MC legend in making) Tyler Jamison. As their lonely and divorced Mother (a strong Kathryn Hahn) prepares for a romantic getaway with her new love interest, Becca and Tyler are preparing for a week long stay with the Grandparents they have previously never met, Doris (a wonderfully unhinged Deanna Dunagan) and John, also known as "Pop Pop" (Peter McRobbie). Since their Mother has been long estranged from their Grandparents, and is also unwilling to discuss the day their relationship fell apart, Becca, with cameras in tow, intends to create a documentary about their visit, hoping to provide some sense of healing, closure and forgiveness amongst her family members. Upon arriving at Doris and Pop Pop's abode in rural Pennsylvania, both Becca and Tyler begin to notice some oddities surrounding their Grandparents' behavior, which only increases and intensifies at night, as the children are instructed to not ever leave their bedroom after 9:30 p.m. With curiosity firmly piqued, Becca and Tyler are witness to their Grandmother crawling around the house on hands and knees like a raving animal, scrawling and scratching the walls while naked and profusely vomiting in the halls. Events in the daylight hours grow ever stranger as Doris appears to be undergoing a psychological breakdown with odd mood swings and as for Pop Pop, he is repeatedly dressing for a costume party that never occurs, mistakenly feels that strangers are following him and Tyler even discovers a batch of soiled adult diapers in Pop Pop's barn. Where Tyler grows more suspicious, Becca chalks up the oddities to the fact that these are the strange habits of old people and remains steadfast in her cinematic pursuits. But soon, those strange habits begin to turn deadlier, leading to terrifying discoveries and confrontations during their final night in the house. M. Night Shyamalan's "The Visit" certainly represents a return to form for the filmmaker as he has taken a "back to basics" approach that often reveals the very best of his talents as well as more confidently displaying a certain subversive and even nasty sense of humor that augments the scares and vice-versa. "The Visit" is a film that is tightly contained and smartly so. Echoing "Signs," the bulk of the film is contained to the Grandparents' house and grounds, therefore increasing the sense of isolation for both Becca and Tyler, as well as intensifying the primal comedy and fear that exists within children looking at unfamiliar adults with quizzically unsure eyes. And here is where the "found footage" technique, one that I will even attest is a tired horror cliche, actually works very well within the confines of "The Visit." By keeping the action stationary to the house, we are therefore confined to a specific space. By viewing the entire proceedings through the lenses of the cameras that both Becca and Tyler operate, Shyamalan then confines everything we see to precisely what exists within the frame. This technique actually showcases Shyamalan's strengths as a filmmaker as I have consistently enjoyed how, especially within our over-stimulating era of filmmaking with ADD editing techniques and bludgeoning soundtracks, he is able to achieve so much actual tension and intensity by not doing very much at all. He has always been strongest knowing what to show, how much and when, in order to intensify the scares and overall sense of unease and with "The Visit," he accomplishes this feat very well. 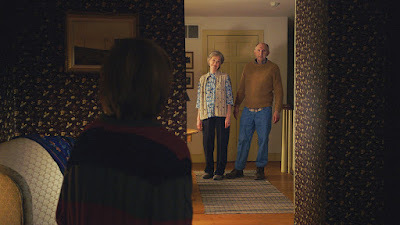 In addition to the "found footage" technique, "The Visit" is also a film that exists without a musical film score, thus allowing all of the film's many silences to provide the tenor of encroaching doom towards our young heroes, especially in the film's strong final third when all is revealed, and convincingly so. Yes, the "found footage" technique is tired, but so is the conceit of "don't open the door" and "don't go in the basement." And even so, M. Night Shyamalan makes both of those particular elements work well in his favor. I have to first give credit to Shyamalan for his excellent casting choices as not only do Olivia DeJonge and Ed Oxenbould (who kind of looks like a very young Dax Shepard) resemble each other (and Kathryn Hahn) so strongly, they are very effective conduits for Shyamalan's story which is indeed sending up the horror genre as much as it is embracing it. These are two precocious, intelligent, verbose and sensitive children, enhanced with their own quirks and foibles, who go on and on about "cinematic integrity" and using the names of female pop stars as substitutes for curse words and who certainly ground the film within a certain reality, giving both the comedy and scares ample room to breathe and flow naturally. A hide-n'-seek chase underneath the house turns from innocent to frightening and then concludes with a fine punch line while keeping the strangeness at the forefront. Grandmother Doris' genteel request for Becca to fully climb inside the oven in order to clean it provides some Gothic humor and queasiness. And those aforementioned adult diapers? Well, for you "germaphobes" out there...well, you'll just have to see that for yourselves but it too provides sick laughs while the danger only grows for the children. As the Grandparents, both Peter McRobbie and Deana Dunagan are highly effective. While McRobbie's aloofness as Pop Pop underlays the film with a sinister malevolence, it is Dunagan who flies off the handle with a madhouse glee. The twosome play off of each other so very well, providing two layers of darkness that ping-pongs between them, keeping the kids off guard while also delighting us in the audience with how much fun they are obviously having in trying to scare Becca and Tyler to death. Now, "The Visit" is not perfect by any means. Some of the jokes are repeated one too may times and perhaps, the film could have been even scarier or more psychologically terrifying as it does not burrow under the skin as effectively as "The Sixth Sense" and "Signs," both of which left me considerably rattled. But, the film's epilogue, which has received some criticism, I actually found to be very effective considering the themes of fractured families, anger and forgiveness that are weaved throughout the film's entirety, again presenting that certain point of view that makes Shyamalan a most individualistic filmmaker who still has something to say about our collective humanity, while also trying to scare the pants off of us. With that being said, I am hoping that M. Night Shyamalan takes whatever good fortune that may arrive from "The Visit" and utilizes it carefully to rebuild the talent that I still attest that he possesses. YOU JUST HAVEN'T EARNED IT YET, BABY: a review of "Mistress America"
Someone...anyone just really needs to tell Greta Gerwig to stop...and immediately! Dear readers, let me just say up front that I have nothing against Greta Gerwig on a personal level. I do not know her and truth be told, she just may be a wonderful human being who is a wonderful romantic partner, daughter, best friend to all, champion of animals and the environment, assists little old ladies across the street and whatever else a terrific person could be and possibly encompass. All of that being said, and based solely on her talents as an actress and regardless of the heaps of critical accolades that have been hurled her way, I absolutely, positively cannot become a member of her fan club. I just do not understand the appeal that Gerwig possesses and has somehow bewitched critics and audiences with. Over her three films with Writer/Director Noah Baumbach, which includes the so-so and somnambulant "Greenberg" (2010) and the horrendously plastic "Frances Ha" (2013), Gerwig has demonstrated over and again that she is just not nearly as beguiling and entrancing as critics, audiences, Baumbach and Gerwig herself thinks she is. She just strikes me as a figure who desperately wishes to be the next great comedienne but is somehow just too smug to allow herself to fully let her inhibitions go and just be a comedienne as she is too busy checking herself out in the mirror all the while. My perceptions of Gerwig's screen persona were fully confirmed in "Mistress America," Baumbach's second feature of 2015, following up his absolutely terrific return to form "While We're Young" from earlier this year. With "Mistress America," we are given the flip side of Noah Baumbach's cinematic coin. Where "While We're Young" was witty, perceptive, multi-layered and even refreshingly bitter, "Mistress America" almost re-defines shallowness as it manufactures a world where not one character, situation or motivation passes for anything approximating the way people truly live, breathe interact and feel. Yes, I can see that Baumbach and Gerwig were attempting to craft a screwball comedy, where the dialogue and behaviors exist within a heightened state. But is there any reason, that for all of the prefabrication, nothing felt to be remotely true considering the story it is trying to tell? And at the center of this plastic confection sits Greta Gerwig, mugging endlessly and flouncing around like the most untalented kid in the school play but who has unctuously convinced herself that she is a Shakespearian trained actress..and will never let you forget it. "Mistress America" is another insufferable tripe of a film that shows how Gerwig brings out the worst of Bambach's creative tendencies. In fact, the best thing that I can say about Noah Baumbach's "Mistress America' is that it is only a mere 84 minutes. "Mistress America" begins promisingly enough as we are introduced to 18 year old Tracy Fishko (played by Lola Kirke), a college Freshman at Barnard University in New York City who is struggling with finding her way in her new environment. Utterly friendless, floundering in her classes and failing to gain the attention of the campus'elite literary journal, Tracy falls into loneliness and disappointment as college and life in New York City have not proven themselves to be the wondrous time she had possibly envisioned for herself. While on a phone call with her Mother (played by Kathryn Erbe), it is suggested that Tracy should reach out to her soon-to-be step sister, the 30 year old Brooke (played by Greta Gerwig), who lives in the city. Tracy soon obliges and upon meeting Brooke, she is swept away by Brooke's adventurousness and undeniable free spirit which contains all manner of nightclubbing, romantic big city apartment living, Brooke's continuously shared stories of her romantic entanglements, personal resentments and her long desired dreams of owning a trendy (but not too trendy) N.Y.C. restaurant. Tracy and Brooke, become fast friends as Brooke's madcap personality, combined with her wacky plans to attain funding for her dream restaurant as well as plot revenge against Mamie-Claire (played by Heather Lind), her former roommate and self-described "nemesis" entrances Tracy and even inspires Tracy's writing, which covertly emerges as the satirical (and highly unflattering) short story entitled "Mistress America." Noah Baumbach's "Mistress America" very much like "Frances Ha" is a film that contains many good ideas and a worthy storyline but is just much too in love with its own sense of self-congratulatory quirkiness and pseudo intelligence to bother to condescend to just telling a decent story. It is precisely the very type of indie film that people who hate indie films would point to as why they hate indie films, and frankly, I could not blame them at all. This is a film that doesn't seem to exist in a world that feels remotely recognizable as the entire escapade feels contained within a set of quotation marks thus giving the film as a whole an ironic distance that works against the good will it is obviously trying to achieve...but without relinquishing any sense of hipster status in the process. From the ironic stiffness of every performance, in which the entire cast behaves as if they know only too well they they are existing within a screwball comedy, therefore draining any stitch of comedy from the proceedings, to the faux '80s electronic pop score by Dean Wareham and Britta Phillips, Baumbach undercuts any sense of truth and poignancy from "Mistress America" and ultimately all of the fun as well. It is the type of film where everyone, but mostly Greta Geriwg's character, speaks in non-sequiturs that feel so labored over and are littered profusely throughout the screenplay, whether they make any narrative sense of not. Want some examples? "New York isn't the New York I used to know. There's too much construction." "I thought I might actually go to college. I'm not an amputee." "I'll probably end up doing something depressing, but young." "There's no adultery when you're eighteen. You should be touching each other all the time." Now on the surface, these may seem to be like some good one-liners but within the content of "Mistress America" as a whole, they all felt as if Baumbach and Gerwig came up with these statements first and then tried to write a full story and screenplay around the lines instead of having the characters arrive at these so-called witticisms organically. It all felt to be so very false and made for a film that was indeed cringe worthy to just listen to as well as one where you would feel sorry for the actors who had to speak this nonsense. But again, this all goes back to Greta Gerwig, who did indeed co-write this screenplay, and it feels as if she is so preciously in love with her words and Baumbach is so preciously in love with Gerwig that there was never a critical eye towards the project, externally and internally within the characters themselves. Yes, there are points where it seems that Tracy and therefore Baumbach is attempting to be somewhat critical of Brooke's outlandishness, most notably in a good scene where Brooke is confronted by a former high school classmate she once tormented and teased. But, as with everything else in "Mistress America," anything more probing is just waved away because Brooke, and therefore Geriwg is just so damn adorable and funny, that no matter what she does, all is forgiven. In fact, it is that very element within the conception and treatment of Brooke that plunges "Mistress America" to its downfall. Let's be real, for all of Brooke's supposed free-spirited effervescence, it just stunned me that at no point during "Mistress America" did any character at any time ever wonder if Brooke was perhaps...oh, I don't know...mentally unstable. This isn't just a "pollyanna-ish" 30 year old who is wayward. Brooke is a young woman suffering from mania, delusions of grandeur, wild mood swings and is a habitual liar who exists within a powerful ADHD fueled narcissism. It would not surprise me if the character happened to be bi-polar but just like the character Tea Leoni portrayed in Writer/Director James L. Brooks' all over the place "Spanglish" (2004), Brooke is clearly suffering from some sort of mental illness that the characters and the movie itself flat out refuses to acknowledge, therefore undercutting any sense of credibility because the film is so in love with her. Over time throughout the film, Tracy's sense of criticism of Brooke becomes not only adoration but sheer emulation in her own behaviors and soon, every character, even the ones who serve as antagonists, are just satellites to her insufferably self-congratulatory sense of whimsy, which Gerwig performs with a complete erratic quality that is so showy and hammy and without any sense of authenticity or depth that she was tremendously off-putting. Instead of drawing me in closer to her with a greater sense of understanding, Honestly, why is Brooke the way she is? Baumbach and Gerwig never once bother to try and delve under her surface, seemingly feeling that her prefabricated antics are enough to win audiences over. Not for me. Greta Gerwig's performance and "Mistress America" as a whole, just continued to not only keep me at arms length, it kept pushing me further and further away. Look, Greta Gerwig, I have to concede, is just not for me and perhaps, and especially after three times at bat with Baumbach, any new film that features Gerwig (and really, any new film that she has co-written to boot), I should just give a wide berth. If you like her and find her cinematic gifts, such as they are, charming, more power to you and have a great time. I just can't join in anymore. THE CONVERSATION: a review of "The End Of The Tour"
"THE END OF THE TOUR"
"Was it good 4 U?/Was I what U wanted me 2 be?" It continues to amaze me how a person's legend and our perception of that legend affects how we all then perceive the work that created that legend in the first place. Dear readers, I have never read the late David Foster Wallace's Infinite Jest, his enormously celebrated, encyclopedic 1,079 page novel (including footnotes) which not only earned the praise of literary critics but also the ever continuing notoriety which has also earned (or maybe has saddled) the novel with the reputation of being one of the finest books ever written. There was a time in my life, mostly during my 20's, when I would have relished a certain challenge with taking on the experience of reading such a lengthy, labyrinthine book but when it came to Infinite Jest, I always found myself pausing. During my then frequent visits to bookstores (ah memories), Wallace's tome was indeed a book I picked up, paged through and placed back down upon the bookshelves time and again and eventually, I gave up on the prospect and moved onwards. Perhaps the legend of the book was just too much for me to handle, jointly in regards to the book's mounting reputation and perceived difficulty as well as the level and quality of Wallace's actual writing, which I may have feared would be so superlative that any dreams I had been housing about pursuing any sort of prose writing on my own would have been painfully extinguished. Those thoughts, long relegated to the deep recesses of my mind, came flooding back to the forefront as I viewed Director James Ponsoldt's striking and surprisingly visceral conversation piece "The End Of The Tour," a film that visualizes the relationship between David Foster Wallace (beautifully portrayed by Jason Segel) and Rolling Stone journalist David Lipsky (an equally riveting Jesse Eisenberg), who is assigned to interview the mercurial writer at the tail end of his Infinite Jest book tour. As the mega blockbuster films have all come and gone, nearly obliterating every other film within their collective paths, I urge you to head out and see this film as soon as you are able for you will indeed be handsomely rewarded with a briskly paced film that is filled with a level of richly textured performances, writing and direction that I sincerely feel will prove inspiring, whether in reading, in being creative or just in provoking a return to the art of interpersonal, face-to-face conversation in the 21st century. "The End Of The Tour" opens in 2008, with David Lipsky's shocked reaction to the news of David Foster Wallace's suicide. The film then flashbacks 12 years earlier, shortly after the release of Infinite Jest, as Lipsky exists as a struggling novelist and dissatisfied writer for Rolling Stone. Initially, Lipsky elicits a certain skepticism towards the mountainous praise heaped upon the novel yet soon becomes a passionate convert, so much so that he convinces the magazine to allow him to travel to Wallace's home base of Bloomington-Normal, IL, near the state university where Wallace teaches a writing course, for an exclusive interview--the first Author interview to be potentially published in Rolling Stone in ten years. Upon Lipsky's arrival from New York to the icy, wintry Illinois, he is greeted with Wallace's guarded yet affably eccentric nature during which the twosome begin to forge a tenuous connection through lengthy conversations (peppered with both men's voraciously shared love of nicotine and sweets) about dogs, women (including Wallace's long running crush over Alanis Morissette), the addictive nature of television, the nature of high vs. low art, as well as poignantly deeper yet somewhat generalized ruminations over the pressures of fame, loneliness, isolation, self-identity, how the world views you in relation to how you see yourself and the need to somehow remain the same individual who created the art in mind and spirit, especially after all of the accolades, attention and the perceptions they create within readers eagerly awaiting whatever will arrive next. Only when Lipsky dares to probe the darker aspects of Wallace's past, from his alcoholism, a rumored bout with heroin and his self-imposed institutionalization during which he was placed on suicide watch, do interpersonal frictions arise between Lipsky and Wallace, thus not only threatening the status of the interview but also Lipsky's desired meeting of the literary spirit between himself and Wallace. Eschewing poor motel lodgings, Lipsky accepts Wallace's invitation to stay in his guest room, while also accompanying him to Minneapolis for the final stop of the book tour, which includes a bookstore reading and signing, an NPR interview, a chirpy tour guide (played by Joan Cusack), and a visit with two of Wallace's female friends, former college classmate Becky (played by Mickey Sumner) and literary critic/writer Julie (played by Mamie Gummer). Over the course of the three days, both Lipsky and Wallace are challenged and faced with their own respective foibles, failures, perceptions and misconceptions about themselves and each other as they individually attempt to navigate precisely what it means to be successful and furthermore, true to oneself in a world where integrity is a decreasing level of currency. 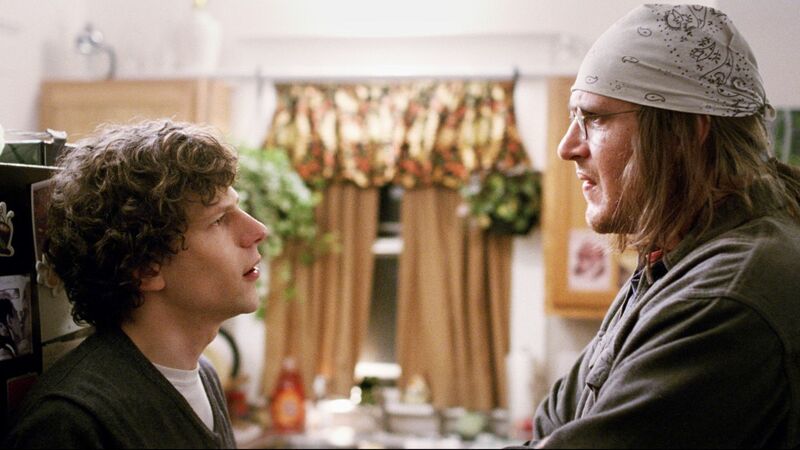 James Ponsoldt's "The End Of The Tour" is a compelling, engrossing and often captivating interior drama that houses an especially mesmerizing duet of performances at the core. Much like his previous feature, the excellent teen drama "The Spectacular Now" (2013), Ponsoldt has expertly crafted a multi-layered film that crystallizes a specific place as well as point in time during which his main characters are forced to confront themselves before being able to emotionally move forwards in life, if at all. I also deeply appreciated Ponsoldt's commitment to truly enveloping the audience within the physical landscape of his film, especially immersing us in the weather, therefore cementing the elements to the moods of the story and characters. Where the hazy, languid, end of summer environment informed the simmering emotions and pivotal changes that awaited the characters of "The Spectacular Now," the frigid, bitter winter of Illinois performs the same feats for "The End Of The Tour," as both Wallace and Lipsky are as burrowed within the shells of their emotions as they are from the elements, cautiously revealing themselves only to quickly dart back into a self-imposed protective hibernation all over again. Mostly, I felt that "The End Of The Tour" was a film experience that proudly exists somewhere in between Director Louis Malle's "My Dinner With Andre" (1981) and Writer/Director Cameron Crowe's "Almost Famous" (2000), as Ponsoldt has weaved a provocative cinematic fabric that is not driven by any sense of a prefabricated plot but actually is as much about ideas as it is about the characters themselves, making for the rare film that provoke and encourages discussion and debate long after you have exited the theater. Ponsoldt has given us the dual character study of two deeply complicated men which serves as a passionately intellectual dance that is superbly fascinating as it simultaneously functions as a vibrant meeting of the minds as well as an exploration of or own success and fame obsessed culture, a culture that certainly performs more damage than good, even in the world of literature. And to that end, the casting of Jesse Eisenberg and Jason Segel in the leading roles could not have been any more perfect. In a peculiar yet somewhat ingenious fashion, it feels as if the performances of both Eisenberg and Segal within "The End Of The Tour" serve as the culmination of both of their screen personas thus far while also representing the figures they each portray within Ponsoldt's film. As David Lipsky is envisioned, he could almost be seen as the fully adult version of characters Jesse Eisenberg performed within Writer/Director Noah Baumbach's "The Squid And The Whale" (2005), Writer/Director Greg Mottola's "Adventureland" (2009) and certainly Director David Fincher's "The Social Network" (2010). While Lipsky is indeed intelligent and definitely skilled and talented enough to have written a novel and have it published as well, he remains internally unfulfilled as the cultural indifference to his written work, plus the Rolling Stone features that he feels are beneath his talents, have unearthed an increasingly aggressive level of competition that houses his latent jealousy, fears of inadequacy as well as an undercurrent of rage, especially towards a figure like David Foster Wallace who seemingly arrived out of nowhere to achieve the meteoric success that has eluded himself. Taking all of those elements into consideration, it feels as if Lipsky's pursuit of Wallace contains increasingly muddled motivations of fan worship (just like the teenaged journalist in "Almost Famous," who mistakenly made friends with the rock stars) plus the disingenuous levels of competition, one-upsmanship and perhaps even attempting to discover that his interview subject is more than a bit of a fraud ("What's with the bandanna?" challenges Lipsky at one point). Throughout the film, Lipsky tries to emulate his subject (the chain smoking, for instance) while also trying to present a certain level of status that he perceives to be on an equal playing field as the celebrated author (for instance, Lipsky's compulsive need to utilize his Rolling Stone expense account as a completely inauthentic show-off tactic). Through his behavior, which alternates from fawning to contentious, professional to cunning, David Lipsky blurs the lines between fan, journalist, critic and potential kindred spirit making for an interview and relationship that it more perilous and even duplicitous than necessary. Perhaps, some of that is due to the nature of the magazine journalism industry but we do often wonder just how much Lipsky is using Wallace for his own gain--as evidenced by the memoir from which this very film has been based. And even then, this realization provides the additional quandary of whether David Lipsky could have ever attained his level of fame and notoriety without David Foster Wallace in the first place. All extremely perceptive and compelling and Jesse Eisenbrg is equal to every moment. As David Foster Wallace, Jason Segal has delivered his finest career performance to date. In addition to his eerie resemblance to the literary figure, Segal has triumphantly delved under the skin, providing seemingly effortless texture and depth in a beautifully understated fashion. I honestly know absolutely little to nothing about the real David Foster Wallace, but in regards to Segal's interpretation of him, I honestly took to this figure at face value despite all of David Lipsky's sly skepticism and jealousy. For me, Segal's David Foster Wallace is a brilliant talent who is also remarkably self-aware about the completely unnatural aspect of his situation and has made a personal choice to remain as grounded as much as he is psychologically able. So, by choice, he remains in Illinois instead of relocating to the pop cultural hotbed of New York. He lives within a completely unassuming home, which Lipsky describes as being a bit of a "frat house," alone with two dogs, and close relationships are at a minimum, also perhaps by choice. His dress is Midwestern sloppy, all layered, baggy clothing with his ever present bandanna covering long, seemingly unwashed hair. He is indeed conversational, ready to engage in a wide variety of subject matter, but he does remain trepidacious with how much he is willing to reveal and even finds the nature of interviews themselves to be nothing more than falsifying works created to deliver public personas that may or may not be true. In fact, Wallace at one point even (jokingly?) suggests that Lipsky can write his article but he should send it to Wallace so that he can re-write all of his quotes, while at other points, Wallace is completely dismissive of the entire enterprise. While Lipsky questions whether his appearance, and soft spoken nature is nothing more than an affectation that only enhances his public persona and belies his formidable intelligence and talent, Wallace is more than aware of those perceptions of him. As I watched "The End Of The Tour," I felt that Wallace was being presented not as a figure who was entirely cultivating a public image that ties in with this impossible novel...even though he is, to an extent, as he is indeed savvy enough to understand the nature of the beast in the fishbowl of celebrity. Mostly, I felt that all of his mannerisms and motivations were a means of self preservation, as he is indeed a fragile, sensitive soul, while blessed with an intense talent, he also carries his internal baggage of addiction and depression. It was almost as if we were watching an adult version of Nick Andopolis, Segal's perpetually stoned yet deeply sensitive character from television's "Freaks And Geeks," someone who was/is repeatedly finding and losing his way, trying to remain sane and a good soul along the way. So perhaps, trying to remain and exist as simply as possible is Wallace's means of maintaining his sense of self and integrity in a world that would tear him down even faster than they built him upwards and touted him as a literary genius. David Foster Wallace's self-awareness is so precise that we can even gather that while he will play the celebrity game, he will do it only to a point. And he is also wise enough to realize that whatever celebrity has been granted to him, it can not only vanish even faster, but would that very cult of personality even taint the integrity of Infinite Jest to boot? Are people reading, and therefore continuing to read Infinite Jest in 2015 because of the inherent quality of the material and Wallace's skills as a writer or it everything tied into Wallace's persona and legacy? Even David Lipsky's arrival for the interview feels false because why else would Rolling Stone magazine even wish to speak with him if not for his (then) current status as golden goose, and whatever rewards they would receive in turn for hitching their train to his? For a creative person and soul like David Foster Wallace, it would seem very likely that all of these conundrums about who is real and false within the widening canvas of his world (which is of course making him feel even smaller), would amount to an extremely confounding and painful hall of mirrors, when all he wishes is to just be left alone to create freely and Jason Segal's expertly pitched performance won me over instantly and completely. After "The End Of The Tour" concluded, I found myself actually walking into a nearby bookstore just to see if any copies of Infinite Jest happened to be available for me to page through once again, especially as I could not even fathom a memory as to what the thing was about in the first place. Unfortunately, the book was not upon the shelf, but within the "Wallace" section of the fiction bookshelves, there was indeed an open space, perhaps freshly open, and just large enough for that book to have been housed inside of. I figured that since the release of the film, interest in the novel had resurfaced, therefore making my inquiry (and anyone else's) suspect as would our collective interest have been as organic as it could have been? Yet, on the other hand, does any of that even matter if Wallace's words are being read at all? This is the true satisfaction of James Ponsoldt's "The End Of The Tour," a film that is as wise as it is entertaining and heartfelt. At one point in the film, David Lipsky suggests that if the written work is the true representation of the author, then perhaps reading the book is a way of meeting the author without having to meet the author in person. And if this terrific film does indeed push me to finally come in contact with the literary work, and quite possibly, an idea of the humanity of David Foster Wallace, organic or no, I think it would have all been worth the time and the journey to find him. My favorite time of the year and in some ways (most likely due to me role as a preschool teacher), the fall feels like a more natural beginning to the year to my spirit. The new school year, with new kids to meet and build a classroom with, along with the changing of the leaves, the fall of the temperatures, the darkening skies occurring earlier in the day...all of those elements speak to me in ways that I cannot fully describe to you, but just know how deeply I love them all. 1. Robert Zemeckis' "The Walk," starring Joseph Gordon-Levitt as the French street performer who staged a tightrope walk between the twin towers of the World Trade Center in 1974 is high on my list to screen. 2. M. Night Shyamalan returns with "The Visit," a lower budgeted thriller that I hope is a return to form for the much beleaguered filmmaker. Even as a viewer who still holds Shyamalan in esteem, I remain skeptical. Hopeful but indeed skeptical. Aside from those, I do happen to have some ideas floating around as there are a couple of titles here at home that have been eagerly waiting for me. So, as always, do wish me luck and I'll see you when the house lights go down.